Join us on June 5th for an online webinar training to volunteer for upcoming opportunities in your area! Share Our Strength's Cooking Matters works to make sure every kid has healthy food every day. Through nutrition education courses, Cooking Matters helps families maximize the benefits they receive through federal nutrition programs like SNAP (food stamps) and WIC (Women, Infants and Children). Founded in 1993, Cooking Matters has been featured by First Lady Michelle Obama's Let's Move! campaign and recognized by the U.S. Department of Agriculture for excellence in nutrition education. 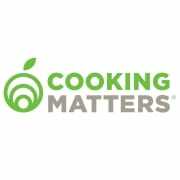 Cooking Matters is nationally sponsored by Walmart. To learn more, visit http://cookingmatters.org/. Cooking Matters Massachusetts volunteers make a positive impact in the community and help end childhood hunger in America. Through six-week, interactive cooking courses, they empower families at risk of hunger with the skills and confidence to prepare healthy, affordable meals. Culinary Instructors - are usually culinary school graduates, currently enrolled in a culinary training program, have at least two years working as a cook or a chef, or are very confident as a home cook. Class Assistants - help before, during and after classes. Duties may include shopping for food, handing out materials, engaging participants, set up and clean up. Nutrition Instructors - are typically graduates of or enrolled in dietetics programs or have at least two years working in a nutrition or dietetics position.